DNS Flag Day, was it a success? Mercurial 4.9 - Whats New? Upgrading MySQL 8.0 (from a MySQL 5.7 GA version (5.7.9 or higher). CVEdetails.com is a free CVE security vulnerability database..
Oracle Solaris and SPARC day will be in Irving, Texas on April 25th (THU)! Register here: oracle.com/a/ocom/docs/dc? 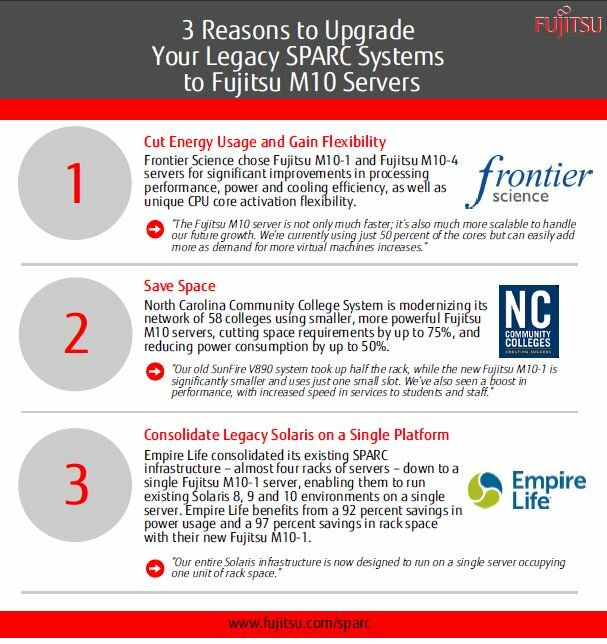 Did you know that consolidating your aging servers to Fujitsu SPARC M12 allows you to stay on Solaris 10, and save big on annual maintenance cost? Oracle SuperCluster combines the power of @OracleExadata storage cells with an integrated application tier to maximize the performance of @OracleDatabase and all applications that run on it. Fujitsu M10 and Fujitsu SPARC M12 servers working hard in 70+ countries! Another fast fact about Fujitsu SPARC M12-2S: Up to 384 cores in a single system image. Did you know that Fujitsu SPARC M12-2S provides the largest maximum memory? [Fujitsu SPARC Fast Fact] Consolidate and save on space, energy, maintenance costs, and more! A new year is just around the corner. Is it time to address the needed upgrade you've been putting off? Discover a smoother way to transition to the latest Oracle SPARC Systems. Rust 1.28.0 is now available in the @OracleSolaris 11.4 support repository as part of today's 11.4 SRU 4 (11.4.4.4.0) release. The Fujitsu SPARC team provides a wide range of resources to our partners! Contact us and let?s collaborate! WEBCAST: Oracle Solaris 11.4 Secure. Simple. Cloud Ready. Did you know that system maintenance costs are is higher for the older hardware? Learn how you can save! Learn how the high-performance, flexible and scalable Fujitsu SPARC M12-2S server can improve any enterprise business workload. Congratulations to Fujitsu SPARC VAR of the year award recipients: Insight Enterprises Inc (U.S.) and @EclipsysTweets (Canada)! You can modernize your server infrastructure and stay on Solaris 10 with Fujitsu SPARC M12/M10! Find out in our latest infographic. When looking for a server to upgrade, what are the 3 most important features for its processor? Just in from Oracle OpenWorld: Encrypted on not encrypted, SPARC M8 is almost 2x faster per core than Intel. So it makes sense to encrypt! Oracle Solaris Kernel Zones now support SPARC M7 and M8 DAX Coprocessors query functionality using the High Performance Kernels library of the Oracle in-memory database product. Flexible & scalable system based on the latest SPARC64 Xll Processor, Fujitsu SPARC M12-2S server! Virtual Datacenter Cloud Framework (VDCF) Version 7.1 is Available! Save on software licensing costs with Fujitsu SPARC M12 /Fujitsu M10 Servers! Everything that is Oracle Solaris and Oracle SPARC at Oracle OpenWorld 2018 in one place. [New Fujitsu SPARC video] Learn how you can save on annual software licensing costs in this short video! SPARC64 Xll Processor = Game Changer! Intel Processor L1TF vulnerabilities: CVE-2018-3615, CVE-2018-3620, CVE-2018-3646, Oracle Solaris on SPARC is not affected by the L1TF vulnerabilities. The powerful, compact and reliable 1U SPARC system, Fujitsu SPARC M12-1 server! Solaris 11.4 is almost here! The 20+ year history of Fujitsu SPARC innovation! Is "Zero-Overhead Virtualization" Just Hype? Zero cost Fujitsu SPARC M12 server loaner program! Have you considered consolidating your legacy SPARC systems to Fujitsu SPARC M12 servers? Oracle + Fujitsu = Strong Collaboration for SPARC development! Whether for your cloud, Big Data, analytics, or database, Fujitsu SPARC M12 will provide the performance you need! Top 5 Reasons to choose Fujitsu SPARC M12-2S server! Did you know Fujitsu has nearly 20 years of SPARC processor development? This week, we are sharing amazing fact about SPARC64 Xll. 2.5X more processing power per core compared to SPARC64 X+! Let's learn about our innovative cooling technology "Vapor and Liquid Loop Cooling" only in Fujitsu SPARC M12! Revealing a secret of our flexible and scalable server, Fujitsu SPARC M12-2S! Pay as you grow with Fujitsu SPARC M12 servers! Happy #EarthDay! 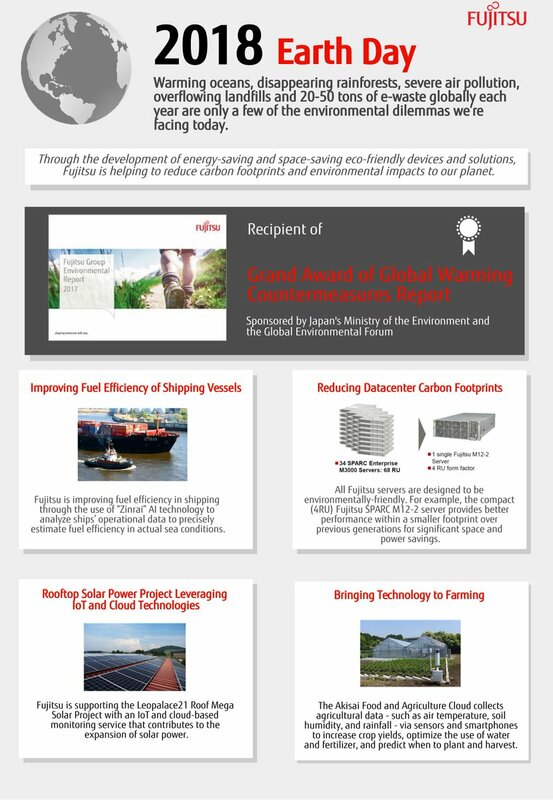 At Fujitsu, we take pride in our continuous innovation of eco-friendly technologies! Did you know Fujitsu SPARC servers feature eco-friendly technologies such as Elastic Power Management and Vapor & Liquid Loop Cooling? Did you know the SPARC64 Xll processor achieves 2.5X more processing power per core than its predecessor (or previous generation)? That means you can save on software licensing fees while getting better performance! The most powerful, compact and reliable 1U SPARC system, Fujitsu SPARC M12-1 server! [New Video] Did you know you can save BIG on software licensing costs with Fujitsu SPARC servers? Top 5 Facts about Fujitsu SPARC M12-2S server! Thinking of upgrading your legacy SPARC systems? Check out how these fellow SPARC users benefited from upgrading to Fujitsu M10 SPARC servers! [Must read] Ricky Okamoto (SVP, Fujitsu SPARC M12 team) discusses the future of SPARC and Solaris! [Data sheet] Flexible & scalable system based on the latest SPARC64 Xll Processor; Fujitsu SPARC M12-2S server! Protect your data and applications with SPARC servers running the SPARC M8 processor. Interested in updating your data center? Try the zero-cost Fujitsu SPARC M12 loaner program. Did you know Fujitsu?s SPARC processor development dates back to the ?90s? The 2nd amazing fact about the SPARC64 Xll processor is our exclusive Vapor and Liquid Loop Cooling (VLLC)! This week, we will be sharing 3 amazing facts about the SPARC64 Xll processor! What advantages does the SPARC64 XII processor offer compared to the previous SPARC64 X+? Mark your calendar! Fujitsu SPARC M12 Servers will be at Collaborate2018 in Las Vegas #C18LV (APR 22-26)! We will be showing the latest cut-model and sharing business benefits. Real World System Evaluation Favors Fujitsu! Got questions for the Fujitsu SPARC 12 team? We are only an email away! DXC Technology can demonstrate that running an Oracle Database workload in the public cloud costs half as much in a SPARC environment as compared to an Intel environment. VDCF Version 7.0.8 our Management Suite for Solaris is available. Including Support for the new Solaris 11.4 Beta! Unrivaled speed, flexible cloud infrastructure, mission critical reliability: Fujitsu SPARC M12 Server! Did you know you can install and migrate to #oracle #SPARC @oracleSPARC #Solaris Server easy using the powerful @jomasoft #VDCF management tool. 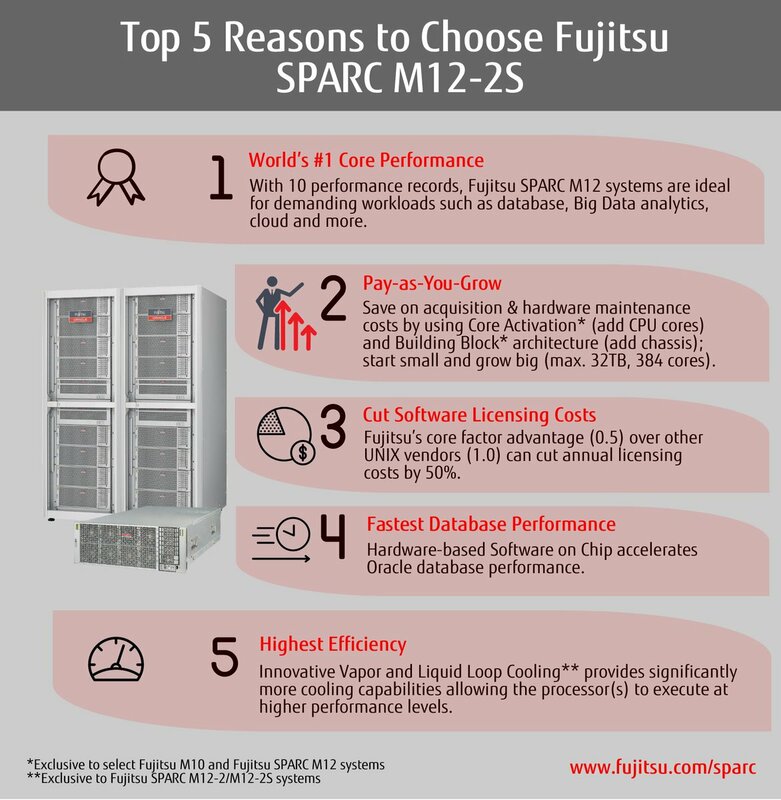 Did you know we offer zero cost Fujitsu SPARC M12 loaner program!? World's #1 core performance, advantages on software licensing? Here are the 5 Things you should know about the Fujitsu SPARC M12 servers! North Carolina Community College System partners with Alphanumeric to deploy Fujitsu M10 servers to ensure students? success! What does the power of the SPARC processor and Exadata storage deliver to the business? TIGI Linea chose Fujitsu M10-1 servers to support its critical e-business and e-commerce functions! Meet the Next-Generation SPARC New SPARC M8 processing power and Software in Silicon features bring better performance and security. 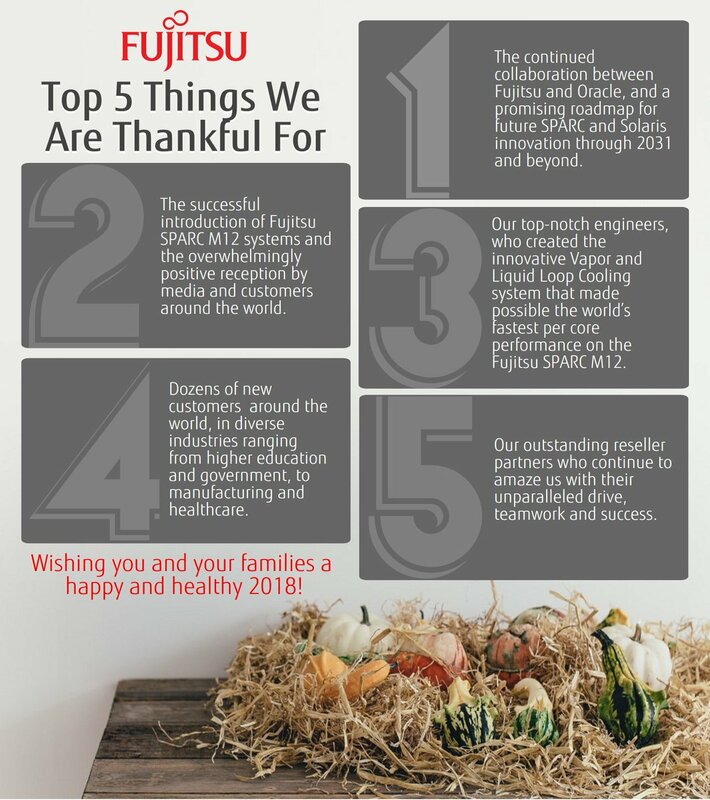 Here are the top 5 things the Fujitsu SPARC team is thankful for. What are your top 5? Server Benchmarks: What Do They Test and Do They Really Matter? [Webcast] @OracleSolarisContinuous Innovation: Modernize without the Risk by Bill Nesheim on Nov 16th! Announcing the Virtual Datacenter Cloud Framework (VDCF) Version 7! Which Oracle SPARC is Right for Your Next Project? Oracle VM Server for SPARC 3.5 Released! Oracle� Developer Studio 12.6 Release - Key Features in This Release SPARC M8 chip capabilities etc. GNU gcc 7.2 & SPARC M8 processor support etc. How good is Oracle Solaris and SPARC M7? Oracle Solaris 11.4 GA - Oracle Solaris 11.4 Package repository. Oracle Solaris 11.4 GA - Oracle Solaris 11.X Legacy Package repository. Oracle Solaris 11.4 GA - Oracle Solaris 11.4 Released!! Lets Take ZFS Device Removal For a Ride. Oracle Solaris 11.4 GA - Announcing the Virtual Datacenter Cloud Framework (VDCF) Version 7.1! Oracle Solaris 11.4 GA - How Can I Secure My Systems Using Oracle Solaris? Oracle Solaris 11.4 GA - Blog posts for building @OpenJDK 10 & 11 on @OracleSolaris x64 and SPARC. Oracle Solaris 11.4 GA - What is Delivered with Solaris 11.4? Oracle Solaris 11.4 GA - Rust 1.28.0 is now available in the @OracleSolaris 11.4 support repository as part of today's 11.4 SRU 4 (11.4.4.4.0) release. Oracle Solaris 11.4 GA - As of Solaris 11.4, all privileged command executions are captured, and can be shown with admhist. I found the quick, global view really helpful. Oracle Solaris 11.4 GA - For the people who use @OracleSolaris as a desktop then watch out #Solaris 11.4.6.4 comes with 64bit Firefox v60.5 (Great news)..
Oracle Solaris 11.4 GA - Filesystem latencies with fsstat. Oracle Solaris 11.4 GA - Give the route a name With Solaris 11.4 working with networks routes got a little bit more comfortable. This blog entry shows how! Oracle Solaris 11.4 Beta - Oracle Solaris 11.4 Open Beta Released! Oracle Solaris 11.4 Beta - reflink(3c) What is it? Why do I care? And how can I use it? Oracle Solaris 11.4 Beta - What's in a uname ? Oracle Solaris 11.4 Beta - Where Did The 32-Bit Linkers Go? Oracle Solaris 11.4 Beta - System maintenance - evacuate all Zones! Oracle Solaris 11.4 Beta - What is this BUI thing anyway? Oracle Solaris 11.4 Beta - One SMF Service to Monitor the Rest! Oracle Solaris 11.4 Beta - Solaris Analytics: Would you like some Python with that? Oracle Solaris 11.4 Beta - Oracle Solaris 11.4 Open Beta Refreshed! Oracle Solaris 11.4 Beta - Is Solaris 11.4 beta a text-only distro? Oracle Solaris 11.4 Beta - Solaris Analytics: what do we collect? Oracle Solaris 11.4 Beta - Is "Zero-Overhead Virtualization" Just Hype? Oracle Solaris 11.4 Beta - Announcing the Virtual Datacenter Cloud Framework (VDCF) Version 7.1! Oracle Solaris 11.3 - Oracle VM Server for SPARC 3.5 Released! Oracle Solaris 11.3 - Continuous Delivery, Really? Oracle Solaris 11.3 - Solaris 10 Extended Support Patches & Patchsets Released! Oracle Solaris 11.3 - After upgrading to 11.3 SRU 35, you can 'pkg install update-check' to get a new benchmark for the compliance command to check for things that you may need to deal with before upgrading to @OracleSolaris 11.4. Oracle Solaris 11.3 - Happy 10th Birthday, ZFS! Oracle Solaris 11.3 - Oracle Solaris 11.3 Preflight Checker - Come Fly With Me! Oracle Solaris 11.3 - OpenStack Cloud Infrastructure White Paper. Oracle Solaris 11.3 - Oracle publishes official Chef and Puppet samples on github..
Oracle Solaris 11.3 - Kickstart from Oracle Solaris 11 ..
Oracle Solaris 11.3 - Do You Use Local IPS Package Repositories? Oracle Solaris 11.3 - System maintenance - evacuate all Zones! Oracle Solaris 11.3 Beta - Kernel zone suspend now goes zoom! Oracle Solaris 11.2 - How Easy Is It To Run OpenStack on Oracle Solaris 11.2? Oracle Solaris 11.2 - How to build a Cassandra multinode database cluster on Oracle Solaris 11.2..
How to Use Oracle VM Templates.. Which Tool Should I Use to Manage Which Virtualization Technology? How to Select a Remote Development Mode in Oracle Solaris Studio? Oracle Solaris11 - Oracle Solaris for IBM AIX Users - Explore the basics of Oracle Solaris 11 administration compared to IBM AIX administration. Zones - What is a Zone? Oracle VM release 3.4.5 is now available! Atomic Scala, Second Edition is Out! Autobook - "The Goat Book"
Erlang - Learn You Some Erlang for great good! Gradle: Gradle Beyond the Basics! The Logstash Book - Now updated for Logstash v5! Python - The Hitchhiker's Guide to Python! Source Code Hosting Sites etc. Backup - How to backup data on UNIX? cpio, tar, dump and restore..
Dtrace - Using DTrace with Sun Studio Tools to Understand..
PostgreSQL - Solaris, PostgreSQL, and NetBeans - Just Perfect! NVIDIA What's a legacy driver?